If you want to find out how compound exercise can help you in increasing your arm size you’re at the right place. In this article we present you the mechanics and benefits of doing compound exercises. If you’re one of those people that rely on doing only isolation exercises for developing your biceps you’ve probably noticed that they are not as efficient in delivering the results. Although exercises like skullcrushers or biceps curls or rope pushdowns do target the arm muscle, they should not be the core of your exercise. Their greatest flow is exactly in that narrow focus of activation. And although many think that they crucial in building the size of your biceps and triceps, the truth is that nothing beats good old fashion compound exercises when it comes to growing your arms. Of course, isolation exercises are very important for adding definition to your arm muscles and should always find their place in your workout routine. But, if you want to grow huge, you’ll have to rely more on deadlifts, squats, pull-ups, and other compound exercises. They don’t activate only tour arm muscles, but involve a great many other fibers from the larger muscle groups. This in turn increases your testosterone production during the workout, which is the real key in boosting your muscle growth. Without testosterone you’ll have problem not only to build up your arms, but any muscle in your body. So think of the compound exercises as a way of building up your arms through total body activation. If you’re convinced, and want to find out a compound exercise that builds your arm size and strength by boosting up your testosterone production, take a peek from our list of suggestions. Dips are a classic strength training exercise that is very efficient in building up your arms. They are primarily focused on your triceps, but also involve chest and shoulder activation. If you want to really fire up your arms, you should focus on keeping your body as straight as you can when you perform them. Begin by using only your bodyweight until you can handle 4 sets of 12 reps. Once you reach this number, it’s time to start adding weight. Unlike the previous exercise the close grip bench presses are not as frequently included in arm training routines, while they should be. This exercise is rather simple to perform – just narrow your grip when performing the bench press. However, by moving your hands you also shift the focus of activation to the triceps. As this variation of the bench press reduces the involvement of your chest muscles, you probably won’t be able to handle as much load as with the regular grip. Start with reduced weight. Keep your rep range to 8-12, and complete 4 sets. Although in the minds of many people the chin-ups and pull-ups are one and the same thing, there’s one minor, yet colossal, feature in their execution that separates them. Namely, while you perform the pull-ups with palms facing away, in the chin-ups you perform the movement with your palms the other way around. 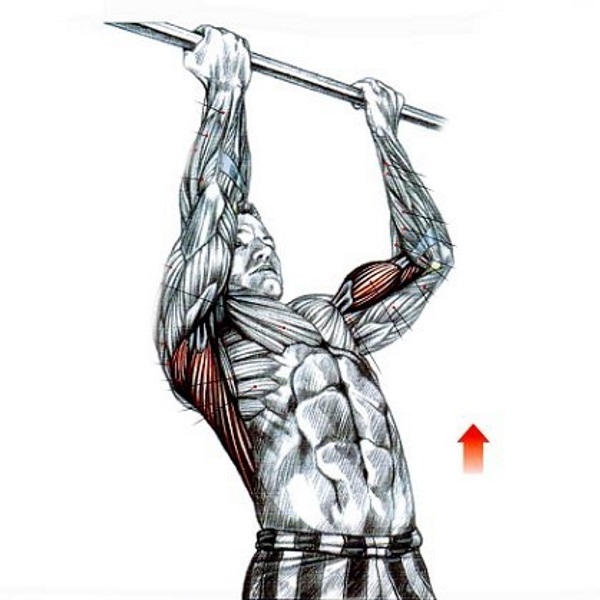 The primary focus when performing the chin-up should be put on using the biceps to perform the lift. You should feel the biceps contract. Start by doing 4 sets to failure with bodyweight. Once you’re able to perform 15 reps in a set, it’s time for adding weight. The chin-up is not an easy exercise and many newbies will find it difficult to pull out even a single rep. If you find yourself among them the trick to overcoming this obstacle is to jump at the top using your momentum. Then, start lowering your body down slowly. In this way you adapt your body to the mechanics of the exercise, and develop the required muscles. However, you should not push yourself too much, as this move is exhausting for your muscles. Five reps should do the trick. Once you’re able to pull out 1 or 2 normal reps, switch to regular chin-ups and build on that. Hold the loaded barbell with your palms facing toward you. Slightly bend your knees and lean your torso forward. Lift the barbells to your stomach. Rotating your grip increases the involvement of your biceps. In addition, performing the rows with your palms facing towards you helps you to increase the range of motion. As a result your lats get more involved in the move. With its ability to recruit a greater variety of muscles, the barbell rows fall in line with the previous exercises that increase your testosterone production.